I've made it a lot easier for you to browse the blog and find what you need. All entries have been assigned to a category -- so one click on a link and you see all the relevant entries. Stop Piracy Graphics -- ideas and graphics from fellow designers. Some graphics can even be used by anyone. 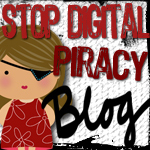 Also includes some tips for dealing with piracy in your business. wonderful site Jen full of great info. I am a needlework designer - primarily cross-stitch with some hardanger and needlepoint. I self-publish, and also publish 7 other designers under my company name... In addition to this, I work with several magazines on a regular basis, and that is actually why I'm writing. Though I usually supply charts and designs to a number of magazines, I am currently working on an article or two for fall issues, regarding piracy and copyright. I wanted to make sure it was ok to repeat quotes from your site (with proper acknowledgement, of course, LOL)... Would hate to write an article about piracy that broke copyright laws! Great site... keep up the good work! My problem is not people sharing my kits, it's that scrappers are reselling my original artwork in "kits" against my TOU and license which specifies that the images may not be resold or redistributed "as is" but must be incorporated into a derivative design. In other words, the design resources (like digitally painted animals and flowers) may not simply be moved from my zipfile into a scrapkit and resold. They would have to be incorporated into the design of a kit element like a tag or a background or a frame or something like that. Also, I'm find a lot of filesharing among scrapbookers. A lot of scrapbook designers believe "commercial use" means "you buy it you can resell it" and do not understand they are licensing artwork for use in specific circumstances and that is can not simply be resold, as is. I'd like some feedback about the TONS of copyright violations I encounter, especially where scrapbookers are truly ignorant of copyright and frankly defiant and believe that original artwork can be resold like a pair of socks they bought at Walmart.